'Tis the season! For bridal fashion that is! Every Spring and Fall, bridal designers flock to NYC to showcase their next season's collections to help bridal boutiques from all over the world decide what they want to bring back to their local shops for their future customers. The Fall New York Bridal Fashion Week tends to be the bigger occasion-- some say it's because of engagement season right around the corner, others say it's because New York is nicer in the autumnal months... well, whichever it is, it's an incredible time to get inspired and to see what will come to be "the one" for many brides here in southeastern Virginia! We are seeing a huge trend in honeymoon wardrobe offerings from many different designers! Gone are the days of only having pretty lingerie and regular ole travel clothes in your suitcase. Now we have a wide variety of luxurious loungewear, poolside accessories, and beautiful garments meant to say "Let's relax as newlyweds." FIND THESE GOWNS IN VIRGINIA/DC: BHLDN can be found in Georgetown, DC. Beads, beads, beads, we saw a lot of sparkly little shimmers this year! From beaded straps to beaded shoes, sparkly beaded details somewhere in a bride's ensemble are definitely a must have for 2016. FIND THESE GOWNS LOCALLY: Allure Bridals can be found at Maya Couture on Main in Suffolk, Virginia. From streamers to keyhole to low-cut, the backs of wedding gowns are getting just as much attention as the fronts! The simple details really do go a long way... after all, you'll have a good chunk of your wedding day photos taken as you walk down the aisle with your back to your guests and photographer... make it a statement of your personality! FIND THESE GOWNS LOCALLY: Wonder by Jenny Packham can be found at David's Bridal in Hampton, Virginia Beach, and Richmond, Virginia. We love that we are seeing the bridesmaid options open up to TONS of options! From cropped tops to layered textures, each bridesmaid can shine in short, long, knee-length dresses-- whatever the wedding style is. These beauties from Donna Morgan showcase a range of trends that we can look forward to in the near future. FIND THESE GOWNS LOCALLY: Donna Morgan can be found at Pure English Couture Bridal in Virginia Beach, Virginia. Along with diversity of necklines, we saw a lot of beautiful and romantic sleeves... and we especially loved these lace and illusion beauties from Moonlight Bridal! For spring or winter, there's a little something for everyone who just wants that little bit of extra gorgeous fabric. FIND THESE GOWNS LOCALLY: Moonlight Bridal can be found at Bridal Elegance in Richmond, Virginia. More and more, brides are looking for a second gown to accompany the party half of the wedding day. Who can blame them?! We could all use an extra dose of sparkles or sequins to complete one of the happiest days of anyone's life! FIND THESE GOWNS IN VIRGINIA/DC: Carol Hannah can be found at Lovely Bride in DC. Which trend is one of your favorites? Want to see more? Catch our trend roundup from last year's New York Bridal Fashion Week! All professional and iPhone photos by Chelsea LaVere. 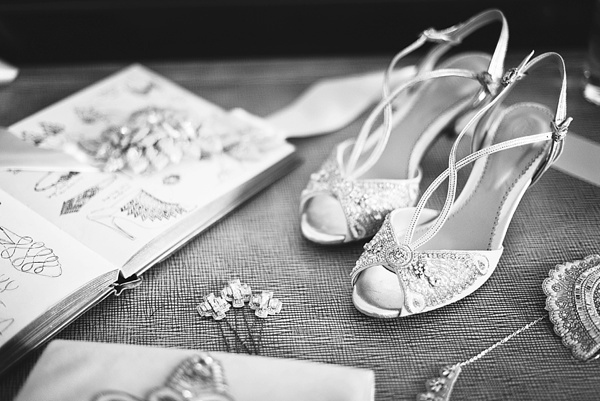 Top photo of gorgeous bridal shoes is of Emmy London's Spring 2016 Collection.